The MLS Reserves: Off The Bench Episode 58: MLS Opening Weekend, Florida for MLS and which teams impressed. 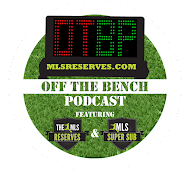 Off The Bench Episode 58: MLS Opening Weekend, Florida for MLS and which teams impressed. After an impressive opening weekend for Major League Soccer, Luke Lohr and Pedro Gomes are back to walk the walk while talking the talk. Which teams impressed us and which players let us down? That and talk of MLS in Florida gets the water churning. Enjoy! Here's the picture Luke was talking about of Mike Magee looking like Bradely Cooper. Chuckles. Your gift for this episode is a video of Real Salt Lake fans doing...something. At least they have a good time at the RioT.